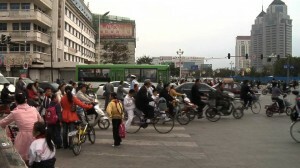 Man Zou: Beijing to Shanghai » Blog Archive » The Game of Death: The art of crossing a street in China! 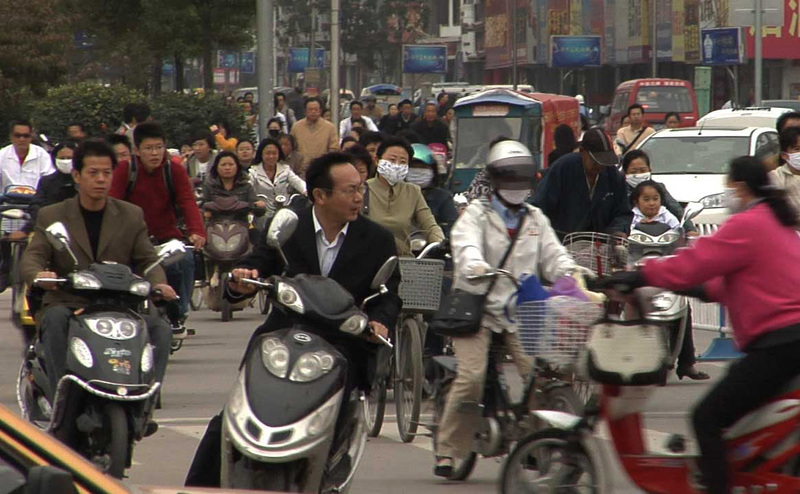 « Shanghai or Bust: Over 3 weeks on the road! The Game of Death: The art of crossing a street in China! Step right up and play The Game of Death! I saw my opening. I pedaled hard and weaved left, then back to the right…Hard on the brakes as a scooter wiped by, then back on the pedal hard. Plenty of room as a car passes behind me. Well the left is done…now for the right. A couple of mopeds, a three-wheeled bike, and a red car. Piece of cake. 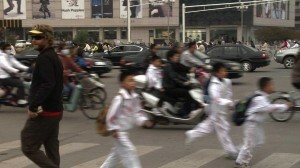 Just another day on the crazy streets of China! I roll out as the mopeds go by, then hard on the pedal again. I have tons of time as I go in front of the red car….Then I see him pop out from behind the red car. I’m looking down the barrel of a late model VW taxi and he has his foot in it. I smile and think, “He’s got me…Well played sir, well played.” I pedal hard out of the seat. It’s a race for the sidewalk and he’s drifting my way with his horn blaring. One final pedal and a little lean. He misses me by inches…and I think he’s laughing! Pretty standard really. There is definitely an art to crossing the street here. It’s a game of inches and timing. I honestly don’t think they want to hit you, but they want to see how close they can get. In the beginning a rule to live by was do what the Chinese do. If you are crossing the street on foot and you see a Chinese person crossing the same street, get in that person’s pocket. However, after awhile you get the timing down. As the intersections get crazier, stay with the Chinese. They play this game everyday! This entry was posted on Thursday, October 9th, 2008 at 1:02 pm	and is filed under camera corner. You can follow any responses to this entry through the RSS 2.0 feed. Both comments and pings are currently closed. I honestly think most people go here for the crab legs and dessert. I know I do. Unfortunately, there seems to always be people at buffets that have what I call “buffet mentality”. They go in, and, thinking that they’re gonna starve, they’ll take as much food as possible and not leave any for anyone else. C’mon! Who really needs to take 2 plates piled high with crab legs? What about everyone else waiting in line? The wait staff is attentive, talking to customers and refilling beverages. I go at least once every 3 months or so, mostly to “catch up” with friends. Don’t go on Friday or Saturday night unless you like noise though.